Joseph Adam Jonas (born August 15, 1989) is an American singer, songwriter, and actor. He rose to fame as a member of the pop rock band the Jonas Brothers, alongside his brothers Kevin and Nick. The group released their debut studio album It's About Time through the Columbia label in 2006, which failed to achieve commercial success. After signing with Hollywood Records, the group released their self-titled second studio album in 2007, which became their breakthrough record. The band became prominent figures on the Disney Channel during this time, gaining a large following through the network: they appeared in the widely successful musical television film Camp Rock (2008) and its sequel Camp Rock 2: The Final Jam (2010) as well as two of their own series, Jonas Brothers: Living the Dream (2008–2010) and Jonas (2009–2010). The band's third studio album, A Little Bit Longer (2008), saw continued commercial success for the group; the album's lead single "Burnin' Up" hit the top five on the Billboard Hot 100 chart. Their fourth studio album, while still successful on the Billboard 200 chart, saw a decline in record sales. After the group confirmed a hiatus, Joe released his debut solo studio album, Fastlife (2011), which saw moderate commercial success. After the Jonas Brothers officially parted ways due to creative differences, Jonas formed the funk-pop band DNCE in 2015, serving as the lead vocalist. The group saw the significant commercial success of their debut single "Cake by the Ocean", which peaked at number 9 on the Billboard Hot 100 chart in the United States. Joseph Adam Jonas was born in Casa Grande, Arizona on August 15, 1989. He is the son of Denise (née Miller) and Paul Kevin Jonas. Jonas' father is a songwriter, musician, and former ordained minister at an Assemblies of God church while his mother is a former sign language teacher and singer. Joe has an older brother, Kevin Jonas, and two younger brothers - Nick Jonas and Frankie Jonas. Growing up in a Christian family, Jonas has spoken on his religious beliefs by saying "I believe in God, and that's a personal relationship that I have, but I'm not religious in any way." In 2002, Joe appeared in Baz Luhrmann's production of La bohème. 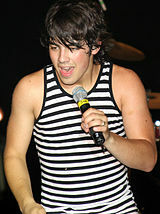 Joe performing in Bessemer with the Jonas Brothers, in 2007. In 2005, Joe, Kevin, and Nick recorded "Please Be Mine", their first song recorded. Upon hearing the song, the Columbia Records president Steve Greenberg decided to sign the brothers as a group. They considered naming their group "Sons of Jonas" before settling on the name Jonas Brothers. While working on their debut studio album, the band toured throughout 2005 with artists such as Jump5, Kelly Clarkson, Jesse McCartney, the Backstreet Boys, and The Click Five among others. The group released their debut single, "Mandy", in December 2005. The album was initially scheduled for a February 2006 release date, though executive changes at Columbia's parent company Sony led to numerous delays on the project's release. During this time, the group began making appearances on various Disney Channel related soundtracks and toured with Aly & AJ throughout 2006. The band's debut album, It's About Time (2006), was released on August 8, 2006. The album received little backing from the label, who had no further interest in promoting the band. During its initial run, the album only received a limited release of 50,000 copies. The album's second single, "Year 3000", had its music video premiere on the Disney Channel in the beginning of 2007. Dissatisfied with how the release of the record was handled, the band hoped to depart from Columbia Records and find a new label; it was later confirmed in 2007 that the group had been dropped by the label. The album went on to sell a total of 67,000 copies in the United States. Only a short period of time after their departure from Columbia Records, it was confirmed that the group had signed a new contract with Hollywood Records. While working on their new album, the group continued to gain popularity due to soundtrack appearances and promotional appearances. The group released their self-titled second studio album through Hollywood Records on August 7, 2007. The album entered the top five of the Billboard 200 in the United States, going on to sell over two million copies in the country. Joe and his brothers made their acting debut on an August 17 episode of the Disney series Hannah Montana titled "Me and Mr. Jonas and Mr. Jonas and Mr. Jonas". The band performed the collaboration "We Got the Party" with lead actress Miley Cyrus, with the episode gaining over ten million viewers and became basic cable's most watched series telecast ever. The group's single "S.O.S" became their first top twenty hit on the Billboard Hot 100, and has sold over 1.5 million copies in the country. Joe Jonas on Jonas Brothers World Tour, in 2009. In May 2008, he and the band began starring in their own Disney series Jonas Brothers: Living the Dream. Jonas made his film debut along with his brothers in the Disney Channel film Camp Rock (2008). The film's soundtrack was released on July 17, 2008, and sold 188,000 copies in its first week of release in the United States. Joe recorded the duet "This Is Me" for the project, with the song reaching the top ten of the Billboard Hot 100 chart. The song served as Jonas' first release outside of the Jonas Brothers. It has sold just over 900,000 copies in the United States. The Jonas Brothers' third studio album, A Little Bit Longer, was released in the United States on August 12, 2008. The album became their first to debut at number one on the Billboard 200 chart, selling over 525,000 in its first week of release. The album went on to sell over two million copies in the United States, making it their second multi-platinum album. The album was preceded by the release of the single "Burnin' Up" (2008), which became the band's first top five hit in the United States. Joe and his brothers starred in the 3D biopic Jonas Brothers: The 3D Concert Experience, which received a theatrical release on February 27, 2009. The film was a financial success and is the sixth highest-grossing concert film. Jonas starred with all three of his brothers their second Disney Channel series, Jonas, which made its debut on May 2, 2009. The show's second and final season aired under the name Jonas L.A. The band released their fourth studio album, entitled Lines, Vines and Trying Times, on June 16, 2009. The project debuted at the top spot on the Billboard 200, boasting first week sales of 247,000 copies. The album failed to match the hype of their previous efforts, failing to cross the one million copies mark in the United States. Joe was featured as a guest judge on a January 2010 episode of the ninth season of the singing competition American Idol. In February 2010, Jonas made a cameo appearance in Vampire Weekend's music video for "Giving Up the Gun" along with Jake Gyllenhaal, Lil Jon, and RZA. He later guest starred in a 2010 episode of Hot In Cleveland as Valerie Bertinelli's son, Will. Jonas starred in the sequel Camp Rock 2: The Final Jam. In 2011, it was announced that Jonas was planning on recording a solo album. Jonas hoped to incorporate elements of funk into the album, though was pressured by Hollywood Records to make a more R&B influenced album similar to releases from Justin Timberlake. Jonas released the album's lead single, titled "See No More", on June 3, 2011. The single failed to have much commercial success, only reaching ninety-two on the Billboard Hot 100 chart. On August 4, 2011, Jonas announced via Twitter that he would join Britney Spears on her European tour starting October 16, 2011. Ryan Seacrest premiered the album's second single, "Just in Love", on September 9, 2011. The single was later remixed to include rapper Lil Wayne, though it failed to achieve commercial success. Jonas later confirmed the album to be titled Fastlife. In support of the album, Joe co-headlined with Jay Sean in the Joe Jonas & Jay Sean Tour with JoJo as the opening act. The tour kicked off on September 9, 2011, and concluded on October 6, 2011. Fastlife was released through Hollywood Records on October 11, 2011. The album sold a total of 18,000 copies in its first week of release, debuting at number fifteen on the Billboard 200. The album quickly fell off of the albums chart, going on to sell a mere 45,000 copies by 2015. On May 2, 2012, it was announced that both the Jonas Brothers and Joe Jonas had parted ways with Hollywood Records. It was confirmed in April 2013 that the Jonas Brothers would reunite to begin working on their fifth studio album and an upcoming tour. Kevin Jonas later starred in his own E! reality series, Married to Jonas, which focused on his marriage to new wife Danielle. The show featured appearances from Joe and Nick and documented the band's preparations for their musical comeback. That same year, Jonas participated in Fox's dating game show The Choice. Jonas began dating model Blanda Eggenschwiler in September 2012, with the two dating until July 2014. Jonas co-wrote the song "Dreams" for the John Legend album Love in the Future (2013). The brothers performed in Russia in September 2012, making it their first live performance since their 2010 tour. Their much-anticipated reunion concert, which had been announced in August 2012, took place on October 11, 2012, at Radio City Music Hall in New York City. The band's fifth studio album, set to be released independently through their own label, was slated for release in 2013. The Jonas Brothers also announced an upcoming North American tour, with tickets going on sale. The album, initially titled V, was preceded by the release of the singles "Pom Poms" and "First Time". On October 9, 2013, the group cancelled their upcoming tour days before it was slated to start, citing a "deep rift within the band" over "creative differences". Only days later, it was confirmed that the band had officially ended. With the band officially broken up, Jonas began working on a new musical project with producers such as Malay and Mattman & Robin. While working on the project, Jonas was unsure whether he wanted to record a second studio album or start a new band. Upon working with Justin Tranter on multiple songs, Jonas decided to form a band with his friends and former touring partners Jack Lawless and JinJoo Lee. Cole Whittle, a member of the alternative rock band Semi Precious Weapons, became the fourth and final member of the group. The group named themselves DNCE, a misspelling of the word dance. DNCE released their debut single, "Cake by the Ocean", in 2015. Their debut extended play was released in October 2015. It debuted at number seventy-nine on the Billboard 200 chart in the United States. In 2018, he joined the Australian version of The Voice as a coach, a year after being a mentor on the American version. In June 2018, Jonas and British DJ Jonas Blue released their collaborative track "I See Love", a song for the film Hotel Transylvania 3: Summer Vacation. He also voiced a character called Kraken in the movie. Starting in late January, rumors were swirling on Twitter and other social medias that the three brothers were going to reform the Jonas Brothers. On February 28th, 2019, the Jonas Brothers officially announced their return along with a new single, "Sucker", which released the next day, March 1st. He dated AJ Michalka for almost a year after he went on tour with her group Aly & AJ in late 2005 to 2006. Jonas dated Taylor Swift for three months in 2008. 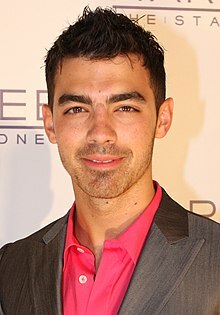 Jonas dated actress Camilla Belle, who appeared in the Jonas Brothers' "Lovebug" music video, for a few months between late 2008 and mid–2009. Jonas was romantically linked to Camp Rock co-star Demi Lovato for several years, but Lovato revealed years later that they only dated for "a month or two" in 2010. He started dating actress Ashley Greene in summer 2010. They broke up in March 2011. He then dated graphic designer Blanda Eggenschwiler from 2012 to 2014. Jonas and Gigi Hadid dated for five months in 2015. She co-directed Jonas' band music video DNCE "Cake by the Ocean". Jonas started dating actress Sophie Turner in 2016, getting engaged to her in October 2017. For the discography with his bands, see DNCE discography and Jonas Brothers discography. 2007 Hannah Montana Himself Episode: "Me and Mr. Jonas and Mr. Jonas and Mr. Jonas"
2009 Atrévete a soñar Episode: "Promesa de amor"
Sonny with a Chance Himself Episode: "A So Random Holiday Special"
Comedy Bang! Bang! Himself Episode: "Joe Jonas Wears a Maroon and Gold Letterman Jacket With White Sneakers"
2017 Angie Tribeca Detective Green Episode: "Boyz II Dead"
^ "Joe Jonas Biography". AllMusic.com. Retrieved December 2, 2013. ^ "The Jonas Brothers: It's full scream ahead". Los Angeles Times. February 26, 2009. Retrieved July 25, 2010. ^ Chebatoris, Jac (January 26, 2008). "The Boy Band Next Door". Newsweek. Retrieved July 25, 2010. ^ Cotliar, Sharon (June 25, 2010). "Growing Up Jonas". People. Retrieved July 23, 2010. ^ Kaufman, Gil (February 7, 2005). "The New Boy Bands". MTV. Archived from the original on November 28, 2014. Retrieved August 22, 2008. ^ Jonas, Joe (December 2, 2013). "Joe Jonas: My Life As a Jonas Brother". New York Magazine. Retrieved December 2, 2013. ^ Jonas, Nick; Jonas, Joe; Jonas, Kevin (2009). "Jonas Fan Van". Disney Channel (Interview). Interviewed by Nicole Anderson. ^ Jones, Kim. "Jonas Brothers – It's About Time". About.com. Retrieved August 22, 2008. ^ "The Boy Choir & Soloist Directory: Nicholas Jonas". Boysoloist.com. Retrieved April 4, 2011. ^ "The New Boy Bands". MTV. March 9, 2006. Archived from the original on November 28, 2014. Retrieved April 4, 2011. ^ a b c d Moss, Corey (April 6, 2006). "More Blink-182 Than Hanson, It's Time For The Jonas Brothers". MTV. Retrieved August 21, 2008. ^ "Disneymania, Vol. 4 > Overview". AllMusic. Retrieved August 29, 2008. ^ "American Dragon: Jake Long episode guide". TV.com. Retrieved August 29, 2008. ^ "Jonas Brothers Chart History". Billboard.com. Retrieved January 20, 2018. ^ a b Trust, Gary (February 17, 2015). "Ask Billboard: Jonas Brothers Want to Know Their Album & Song Sales". Billboard. Prometheus Global Media. Retrieved February 17, 2015. ^ "The Jonas Brothers Sign Record Deal With Disney's Hollywood Records" (Press release). Hollywood Records. February 8, 2007. Archived from the original on February 13, 2007. Retrieved July 16, 2008. ^ "2007 White House Easter Egg Roll: Frequently Asked Questions". Georgewbush-whitehouse.archives.gov. April 9, 2007. Retrieved July 30, 2011. ^ "Tee Ball 2007". Georgewbush-whitehouse.archives.gov. Retrieved July 30, 2011. ^ "Meet the Robinsons (soundtrack)". Amazon.com. Retrieved September 1, 2008. ^ Kosidowski, Paul (July 7, 2008). "Jonas Brothers thrill tween audience at Summerfest". Journal Sentinel. Archived from the original on February 14, 2009. Retrieved July 3, 2009. ^ Peoples, Glenn (March 26, 2015). "Why Zayn Malik's Departure From One Direction Won't Hurt Band's Music Sales". Billboard. Prometheus Global Media. Retrieved March 28, 2015. ^ Joal Ryan, "High School Musical 2 Big 2 B Ignored" Archived July 17, 2008, at the Wayback Machine, E! News, August 18, 2007. ^ "Episodes: Jonas Brothers: Living the Dream". TVGuide.com. Retrieved October 26, 2010. ^ "Coldplay Cruises To No. 1 On The Billboard 200". Billboard. June 25, 2008. Retrieved June 9, 2009. ^ "Music: Top 100 Songs | Billboard Hot 100 Chart". Billboard. Prometheus Global Media. ^ "Ask Billboard: Baseball Hits, Gwen Stefani's Delay & & Demi Lovato's Best-Selling Songs". Billboard. Prometheus Global Media. October 12, 2014. Retrieved October 12, 2014. ^ "Jonas Brothers – A Little Bit Longer". Billboard. Archived from the original on April 22, 2013. Retrieved August 17, 2008. ^ "Why Zayn Malik's Departure From One Direction Won't Hurt Band's Music Sales". Billboard.com. Retrieved January 20, 2018. ^ David Jenison (July 24, 2008). "Jonas Brothers Pushin' the Record Books". E! Online. Retrieved July 31, 2008. ^ "Empire Leicester Square is Europe's First Theatre with Dolby 3D for Large Screens". Retrieved August 3, 2013. ^ "Music Concert Movies at the Box Office - Box Office Mojo". Boxofficemojo.com. Retrieved January 20, 2018. ^ "Jonas Brothers blog". Archived from the original on January 5, 2010. Retrieved August 3, 2013. ^ "Show Tracker". Latimesblogs.latimes.com. Retrieved December 8, 2014. ^ Abrams, Natalie (November 9, 2009). "Jonas Brothers' Disney Channel Show Picked Up for Season 2". TV Guide. Retrieved October 20, 2010. ^ "Artist Chart History". Billboard. Retrieved July 3, 2009. ^ Peoples, Slenn (March 26, 2015). "Why Zayn Malik's Departure From One Direction Won't Hurt Band's Music Sales". Billboard. Prometheus Global Media. Retrieved March 28, 2015. ^ Vena, Jocelyn (August 19, 2009). "Joe Jonas To Guest-Judge 'American Idol' In Dallas - News Story | Music, Celebrity, Artist News | MTV News". Mtv. Retrieved July 25, 2010. ^ Vozick, Simon (February 19, 2010). "Vampire Weekend are 'Giving Up the Gun' with Joe Jonas, Jake Gyllenhaal, Lil Jon, and RZA: Watch their wacky video here | EW.com". Entertainment Weekly. Retrieved July 25, 2010. ^ "Joe Jonas Hot In Cleveland". oceanUP.com. Retrieved July 25, 2010. ^ "Disney Already Planning Sequel To Camp Rock | ChattahBox News Blog". Chattahbox.com. June 17, 2008. Retrieved July 30, 2011. ^ Cheung, Nadine (May 20, 2010). "Joe Jonas Is Working on His Very Own Solo Album". Jsyk.com. Retrieved July 25, 2010. ^ "Joe Jonas Puts His Disney Past Behind Him With New Pop-Rock Group DNCE: 'It's a Big Risk'". Billboard.com. Retrieved January 20, 2018. ^ "Joe Jonas Says First Solo Single 'A Dream Come True'". mtv.com. May 16, 2011. Retrieved May 22, 2011. ^ Jonas, Joe [@joejonas] (August 4, 2011). "It's official. Performing on the European leg of @britneyspears tour. Click for confirmed cities in People.com interview (link: jonas.cta.gs/03f) jonas.cta.gs/03f" (Tweet). Retrieved March 11, 2019 – via Twitter. ^ Cotliar, Sharon (August 4, 2011). "Joe Jonas Joining Britney Spears on European Tour". People. Retrieved August 12, 2011. ^ "PREMIERE: New Single From Joe Jonas". American Top 40 With Ryan Seacrest. September 9, 2011. Archived from the original on March 20, 2012. Retrieved September 13, 2011. ^ "Joejonasmusic : Resources and Information". Joejonasmusic.com. Retrieved January 20, 2018. ^ "JoJo Joins Joe Jonas and Jay Sean Tour". Rap-up.com. August 19, 2011. Retrieved May 24, 2012. ^ "Joe Jonas & Jay Sean Tickets | Joe Jonas & Jay Sean Concert Tickets & Tour Dates". Ticketmaster CA. Archived from the original on March 25, 2012. Retrieved May 24, 2012. ^ Maloy, Sarah (July 29, 2011). "Joe Jonas Sets New Album Release Date, Opens For Britney Spears". Billboard. Retrieved September 13, 2011. ^ Caulfield, Keith (October 19, 2011). "Evanescence Nets Second No. 1 Album on Billboard 200 Chart". Billboard. Retrieved October 19, 2011. ^ Vena, Jocelyn. "Kevin Jonas Partners With Ryan Seacrest For 'Married To Jonas'". MTV News. Retrieved April 30, 2012. ^ Shaw, Jessica. "Jonas brother lands E! reality show | Inside TV | EW.com". Insidetv.ew.com. Retrieved May 24, 2012. ^ Hibberd, James (May 8, 2012). "Fox's 'The Choice' cast revealed! Joe Jonas, Dean Cain, The Situation, many more -- EXCLUSIVE". Entertainment Weekly. Retrieved April 11, 2013. ^ "Why Joe Jonas Waited to Address Drug Rumors". October 31, 2013. Retrieved November 3, 2013. ^ Cosgrave Baylis, Sheila (August 5, 2014). "Joe Jonas and Blanda Eggenschwiler Split". People. Retrieved August 5, 2014. ^ "jøe jønas on Twitter: "Honored to have co-written Dreams on the new john_legend album go support and pick up his new record!"". Twitter. Retrieved October 24, 2014. ^ "JonasHQ.Org | Your #1 Fansite and Exclusive Source for the Jonas Brothers " Team Jonas Meet & Greet Sweepstakes for NYC and Russia!". JonasWorld.Org. Retrieved January 3, 2013. ^ "JonasHQ.Org | Your #1 Fansite and Exclusive Source for the Jonas Brothers " Moscow, the Jonas Brothers are headed your way!". JonasWorld.Org. March 30, 2008. Retrieved January 3, 2013. ^ "The Jonas Brothers Announce They'll Reunite For ONE Concert!". RyanSeacrest.com. August 17, 2012. Retrieved August 28, 2012. ^ "iTunes - Music - Pom Poms - Single by Jonas Brothers". itunes.apple.com. April 2, 2013. Retrieved August 22, 2013. ^ "Jonas Brothers cancel tour days before first show due to 'deep rift within the band'". ^ "Irish Independent - 'We're closing a chapter' - American group The Jonas Brothers split". Independent.ie. Retrieved October 24, 2014. ^ "Joe Jonas Puts His Disney Past Behind Him With New Pop-Rock Group DNCE: 'It's a Big Risk'". Billboard. October 8, 2015. ^ "Interview with DNCE". 997now. November 5, 2015. Archived from the original on January 29, 2016. ^ "Get Ready to DNCE". Interview Magazine. October 23, 2015. ^ "8 Questions with Joe Jonas's New Band, DNCE". InStyle. October 16, 2015. ^ "Joe Jonas forms new band". Toronto Sun. September 16, 2015. Retrieved October 27, 2015. ^ "SWAAY - EP - DNCE". iTunes. Archived from the original on September 30, 2016. ^ "DNCE - SWAAY EP". ^ "Joe Jonas & Jonas Blue Team Up for Tropical 'Hotel Transylvania 3' Song 'I See Love': Watch the Lyric Video". Billboard. June 29, 2018. Retrieved February 9, 2019. ^ Jonas Brothers [@JonasBrothers] (February 28, 2019). "Midnight ET #Sucker (link: JonasBrothers.lnk.to/suckerTw) JonasBrothers.lnk.to/suckerTw" (Tweet). Retrieved March 11, 2019 – via Twitter. ^ Lakshmin, Deppa (July 14, 2016). "This Former Disney Channel Star Just Revealed Joe Jonas Was Her First Kiss". MTV. Retrieved February 9, 2019. ^ Caplan, David (September 8, 2008). "Scoop". People. Archived from the original on February 2, 2016. Retrieved March 6, 2012. ^ Rizzo, Monica (November 24, 2008). "Scoop". People. Archived from the original on March 3, 2016. Retrieved March 11, 2019. ^ "It's Official: Joe Jonas and Camilla Belle Have Split". People. July 27, 2009. Retrieved March 11, 2019. ^ "Joe Jonas and Camilla Belle call it quitsi". July 27, 2009. Retrieved July 28, 2009. ^ Rendon, Christine (October 11, 2017). "'We had our first kiss on camera!' Demi Lovato relives the moment she fell in love with ex Joe Jonas in Disney movie Camp Rock". Daily Mail. Retrieved March 7, 2018. ^ Michaels, Wendy (October 11, 2017). "Did Demi Lovato & Joe Jonas Date? 'Tell Me You Love Me' Singer Opens Up About Their Past". Elite Daily. Retrieved March 7, 2018. ^ Nudd, Tim (March 17, 2011). "Ashley Greene and Joe Jonas Split". People. Retrieved February 9, 2019. ^ Baylis, Sheila (August 5, 2014). "Joe Jonas and Blanda Eggenschwiler Split". People. Retrieved February 9, 2019. ^ Elizabeth, De (August 23, 2016). "Joe Jonas Wrote Gigi Hadid Breakup Songs". Teen Vogue. Retrieved February 9, 2019. ^ Whitney, Alyse (October 16, 2015). "Gigi Hadid Directed Joe Jonas's New Music Video — and It's Literally Sweet". Teen Vogue. Retrieved February 9, 2019. ^ "Joe Jonas and Sophie Turner announce engagement on Instagram". NY Daily News. Retrieved October 16, 2017. ^ "Watch The Trailer For Zoolander 2, Featuring Miley Cyrus, Demi Lovato, Justin Bieber, & Joe Jonas". Beautiful Ballad. Retrieved April 4, 2011. ^ Knox, David (December 14, 2017). "Nine announces new celebrity judge for The Voice 2018". TV Tonight. Australia. Retrieved December 14, 2017. Wikimedia Commons has media related to Joe Jonas.